Since the 1940s, hydraulic fracturing (also known as fracking) has been used to facilitate the flow of natural gas and petroleum, among other materials, through wells in rock formations. This process is the last step in well production and involves the use of fracking fluid and a substantial amount of pressure to stimulate flow. The main component of fracking fluid is water, which can be obtained from a variety of sources, as well as certain additives like sand and chemicals. While fracking is considered to be controversial in some circles, it’s still being widely used today, particularly throughout the United States. Fracking has played an important role in American energy independence, and it’s one reason that North American exploration and production companies will spend 25% more than their overseas counterparts. But to do their job effectively, organizations and industries that utilize hydraulic fracturing require reliable fracking containment. And, more and more, oil and gas companies are demanding flexible, portable, and modular fracking containment solutions. Traditional large capacity frac tanks are steel and often blue in color. They can hold 21,000 gallons of water and are able to be hooked up to pumps, filters, and vacuum boxes for big projects due to their multiple valve access points. These tanks are designed to allow all of the fracking fluid without having to slope the tank, even on tricky terrain. 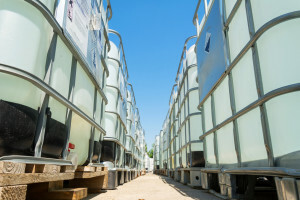 Most projects will require numerous tanks, which are typically placed all in a row. Modular large capacity frac tanks are made from galvanized steel sheets and can be compacted for easy shipping and transport. While there are 21,000 gallon options available, modular frac storage options can be made to accommodate up to 1,000,000 gallons. Linings, covers, and leak detection equipment can be used in conjunction with these modular options. Instead of several separate tanks, modular tanks can be made to accommodate different sizes and shapes, which means only one tank is needed in most cases. While those 21,000 gallon tanks are popular, they’re not always the best choice for a given project. Prefabricated modular frac tanks are easily assembled on-site and don’t require heavy equipment; they can be installed using simple hand tools. They can also be disassembled just as easily, should you need to store your tank or relocate it after a project is finished. They can even be reconfigured into different sizes and shapes as needed. Just as importantly, they also cost a lot less than other comparable options. And because they’re lower in height, ladders and platforms are unnecessary. If your organization is involved in hydraulic fracturing and your project site has unique containment challenges or requires a substantial amount of water storage, traditional frac tanks may not suit your needs. Modular frack containment options will often be easier, less expensive, and a better fit for the task at hand. Ready to learn more about modern, modular frac tanks? Contact Modutank for more information.